It is NOT really a 7 minute workout! The original article which appeared in The American College of Sports Medicine Journalstated for most people the circuit program should be repeated for 2 or 3 times (totaling 21 minutes) for maximum benefits. I guess titling the article “The Scientific 21-Minute Workout” wouldn’t sell as many newspapers. In order to receive the cardio and insulin sensitivity benefits one would need to do this workout at 100% of Vo2 Max….not likely for an average person. Working out for 7 minutes with body weight isn’t going to make a sizable difference in individual’s health or fitness level. Especially if the rest of the day they do what most American’s do: sit and remain sedentary. 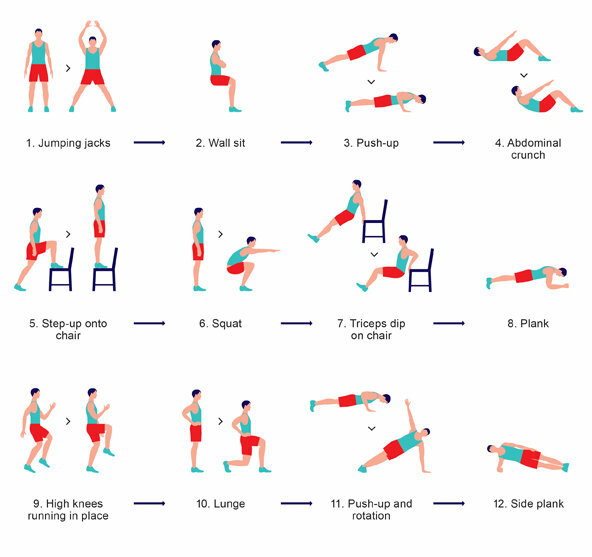 Not all exercises are created equally and there are many in this routine that will do little in regards to increasing energy expenditure and cardiopulmonary benefits. The crunch, plank and side plank are low intensity exercises with little strength and cardio benefits. The triceps dips exercise is a contraindicated movement for many people with shoulder instability, pain or heavy body weight. Optimum extension of the average shoulder is 20 degrees yet when performing the exercise one’s body-weight might take them into 90 degrees of extension which might cause inflammation of the shoulder capsule and surrounding soft tissue. Perhaps a close hand ‘diamond’ push-up would be a better substitute. Strength increases in this workout are severely limited to one’s body-weight and lack of progressive overload. In theory as one progressed in this routine they would lose weight and the exercises would become easier and easier which would create a plateau. According to the US Department of Health we need at least 150 minutes of moderate exercise per week (or 75 minutes of intense exercise) in order to improve your health. Science has been pretty clear in showing a causation with the more moderate activity one gets the better the mental health benefits . So if you are looking to decrease depression or have a better temper you need to participate in more than 20 minutes of moderate exercise per week. This plan calls for little variation and thus is more predisposed to increase joint wearing, exercise stagnation, boredom and quick plateaus. A cookie cutter approach is never a good idea for a diverse population unless you want to get sub-par results or produce injuries. Your workout should take into consideration your goals, contraindications, fitness level, age, risk factors, health and diet. Anything short of this is irresponsible at best and injurious at its worse. Please don’t get me wrong, the 7-minute workout undeniably has some benefits, but just as many limitations. There is nothing wrong with the workout for the untrained person, and it can be a great starting solution for anyone looking for a quick training session. Furthermore it could stand in as a effective workout to maintain your current fitness levels when time is tight or on vacation. Over the long haul it is not a well designed program for someone looking to maximize fat loss, lean muscle gains and increase strength. It isn’t going to transform anyone from couch potato to elite athlete, but if it gets the sedentary people in our society more fit then its a win win for us all and our health care system. Seven minutes is better than nothing! This entry was posted in 7 minute workout, circuit training, exercise, Plank, review of 7 minute scientific workout, workouts and tagged 7 minute workout, HITT workout, scientific workout, short workouts on May 22, 2013 by Doug.